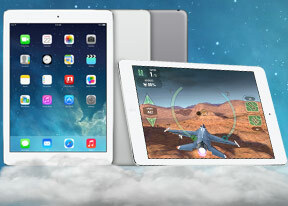 Apple iPad Air is running on the same chipset the Apple used within the iPhone 5s - the A7. It's company's first 64-bit mobile system-on-a-chip and as usual Apple claims it is twice as fast as the previous A6 chip. The Apple A7 28-nm chip is comprised of a 1.3GHz dual-core CPU dubbed Cyclone which uses ARM's ARMv8 microarchitecture (yet to premiere with the Cortex-A53 and Cortex-A57 processors). The GPU, while not officially confirmed, is believed to be the PowerVR G6430. The use of a 64-bit instruction set for the CPU enables Apple to put more than 4GB of RAM on its future generation of products, but the iPad Air, just like the iPhone 5s, packs just 1GB. Not that this feels insufficient - the way iOS handles multi-tasking you are extremely unlikely to run out of operating memory. Moving on to actual benchmarks we start with the Geekbech 3 test to see how the CPU and memory are doing. The iPad Air blasted through the test managing to beat every device we've tested so far but the Galaxy Note 3. It scored very close to the iPhone 5s and the Snapdragon 800 competition though. We also ran the iOS version of Linpack. Once again, iPad Air scored a hair better than the iPhone 5s, which has the same chipset. It is also twice as better as the previous A6 chip, just as promised. Now, it's time for the multi-platform GFX Benchmark that gives the GPU a run for its money. The iPad Air took the second place in our all-time chart, just few fps shy of beating the Galaxy Note 3 for the top spot. The iPad Air did better than the iPhone 5s by a whisker, again. We also ran the GFX Benchmark on-screen tests. Quite expectedly, because of the iPad Air's higher resolution screen, it delivered a lower framerate than the iPhone 5s on the high-quality T-Rex graphic test. Still, the iPad seems perfectly equipped to handle every modern game hassle-free. Basically the iPad Air is as fast as the iPhone 5s. It has higher resolution to handle though, so it delivers a bit lower GPU performance than the iPhone 5s, but is still one of the most capable and powerful devices we've seen so far. The new CPU architecture and the latest generation PowerVR Series 6 GPU are currently the best performers on the market and will leave nobody disappointed. A new iOS version just can't afford to pay no attention to Siri. After more than two years in development the assistant has finally graduated from beta. Just as the rest of the iOS 7, Siri now looks different. It always launches in full-screen and has a real-time voice graph. Another UI novelty is the option to edit your voice request with the keyboard in case Siri didn't hear you right. Siri supports and understands English (American, Canadian, Australian, British), French (France, Canada, Switzerland), German (Germany, Switzerland), Japanese, Italian (Italy, Switzerland), Spanish (Mexico, Spain, US), Mandarin (China, Taiwan), Korean, and Cantonese (Hong Kong) languages. The most important Siri upgrades, of course, are under the hood. Siri now has Wikipedia integration and it offers new voices, there is both female and male English US for example. Siri can also carry out commands affecting the iOS - it can turn Bluetooth or Wi-Fi on/off, increase brightness, play voicemails, check other people's social network status, play iTunes Radio stations, etc. Siri is a really powerful voice assistant capable of POI search. Assistance with restaurant booking is part of Siri's set of skills. It will find you exactly the restaurant you are looking for and filter the results based on user reviews. You can run impressively detailed searches based on food type, location, outdoor, pool, price range, ratings, etc. This feature is not available in every country, though. Siri also answer slots of questions and isn't limited to game scores. History, stats, player bios, player comparison, teams, records, etc. Siri should be able to return most of the info right onto its own screen, without switching over to the browser. The same applies to movies. You will get all of your movie-related answers right inside the Siri window - anything about actors, directors, awards, movie stats, premieres and tickets, reviews, trailers, etc.